The fact that a classroom can make a list of important places is important to me. Over the last ten years, I’ve become increasingly interested in classroom space and how a classroom’s look and feel contributes to students’ socio-emotional health and academic success. I grew up with the inspiration of my mum’s amazingly decorated third grade classroom. I know how I felt special and excited to learn in her room, and I wanted my own students to feel the same way. But yet, when I Googled or Pinterested (is that a verb yet?) “classroom decor,” 97.8% of the examples came from elementary and middle school spaces. High schoolers deserve non-sterile and creative spaces to learn just as much as they still deserve scratch and sniff stickers (although the other week I accidentally gave them stickers that smelled like dirt, and I had to beg them to believe that I didn’t think their work was dirt). And so I improvised and modified. At first, I decorated with mostly things that I loved. I put up pictures of my favorite books. I decorated entire walls with zombie memorabilia (did you know I have an obsession with zombies?). I hung postcards of my favorite places that I’ve traveled. It begins in August. 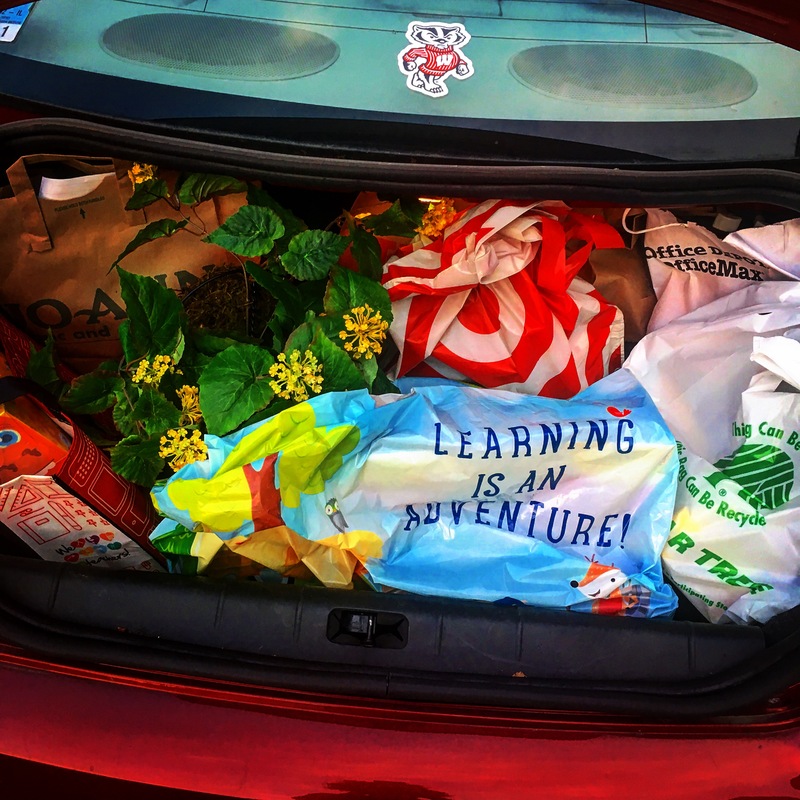 This is what my trunk looked like going into this school year. I think it took six different shops to get all of the supplies I need. Don’t worry–I’m a bargain hunting machine! But you know what I realized? The classroom isn’t about me. In fact, I should switch the pronoun from “my classroom” to “our classroom.” If I want to support the multiple identities of my students, I need to make sure that the objects in my classroom reflect that value. And so, I started putting up things my students liked, as well as their work. I hung up gifts that they gave me. I handmade mailboxes so that each student could have a space to hold their journals and important papers. Above my door on the inside. Whenever my students are featured in news articles, I paste them underneath the “313 in in the news” sign I made out of poster materials from Walgreens. The basketball hoop is one of my favorite additions to my classroom. Students shoot before school, in between classes, and after school. Some intense debates have been settled through shoot offs. I have some really squirrely freshmen in study hall, and they run from their previous class to get four and a half minutes of a basketball game in before the bell rings. And let me tell you, they get quite intense and once even drew blood while a sub was there, but it makes study hall go much more quietly and smoothly. Trust me! I love this idea for exit slips; thanks Pinterest! It’s awesome to have students (or teachers, as this picture shows reflections from a professional development workshop I gave) stick their musings to the door on the way out! The bottom of my door on the inside. I got these felt stick-on letters in the bargain bin at Target! I love doing warm fuzzies with my seniors. Students write warm fuzzies (little notes of appreciation and love that make you feel all “warm and fuzzy” inside after you read them) to each other all semester long, and then the students get to take their stuffed envelope with them as a parting graduation gift. Sometimes I buy fancy ones like this from the Chicago Teacher Store. But if I’m low on cash, I’ll sneak these plain envelopes from the Division office and have students decorate them with pictures and words that best represent them. One of my favorite additions this year is a life sized Frederick Douglass. Not only is he one of my all time heroes, but he is also a quiet and important watchful force in the room. I mean, seeing as this man sacrificed everything to read and write to gain his freedom, what student would dare not read in from of Freddie D. Right? (And he really is huge. I’m 5’11 to put him to scale). My mom made me this banner out of an old dictionary, stencils, and black paint. I loved it so much we made more for other teachers! This area is right when students walk into the room. I try to provide everything they need to feel comfortable (not pictured but always provided: bandaids). I don’t fight with students about not having a pen or pencil (see: What it’s Like to be a Teacher at the End of Summer Break). Instead, they can simply help themselves. All things here are provided from my own pocket, but I got things like the cloth and holder I got cheap at Michael’s and TJ Maxx respectively! One of the most important thing a teacher can provide is lotion. Students passing by in the hallway will stop by and say hello just to get a couple of pumps. I’ve learned now that my students love Cocoa Butter in the winter. Here is my “desk.” I don’t ever use it as it’s pushed against the wall to give my room an open floor plan feel. The picture of my family is really the only thing that is just for “me” in the room. I got the flowers from my summer in Oaxaca, Mexico, a teacher who did a peace circle in my room left the shark and I kept it (is that bad? ), and my mother gave me the smile on stick (it is really helpful when a student is particularly grumpy one day). I spent $5 on the personalized pop art sign using Fiverr.com and then printed the poster at school. The story goes, I told the students that if I had to say my absence policy one. more. time., I was going to have to make a poster out of it. So guess what I made the very next week? The paper cranes hung from my students are special, as I had the students write their wishes on them, and then my mom and I folded them up (I initially had them try to fold them in class, and it went very, very badly) and I put them on the ceiling as a reminder for them to reach for their goals every day. You can check out my snap about it here. I’ve got to have board games on standby for a rainy day. The back wall in the middle includes quite possibly my favorite thing: the bird clock! I got it as a gift from my beloved late Grandma Marge. It provides a very loud chirp of a different bird at the top of the hour. The first couple of weeks of school, students jump every time it chirps. By the end of the year, they don’t notice it (unless it’s Daylight savings time, and I forget to change the clock. The new bird chirp will throw them off!). I try to change the little whiteboard with a quote of the day. If it’s a student’s birthday, we celebrate here. I have an amazing student this year who will change the quotation for me if I should forget! Here is the little reading room in the corner. Students love to sit in these much more comfortable chairs for reading time! The top of my mailboxes. Students can leave something for in me in my mailbox (they never do) or they can pick up an affirmation if they are having a tough day! These are the student mailboxes I spent 17 hours constructing one summer. Totally worth the time to stay organized and for students to feel that they have a place in the room. My friend Jaz gave me this idea, and my mom helped my vision come to fruition. She painted a boarded green and then drilled in an antique candle holder. I had my friend Liz do the lettering! Here are some examples of some of the affirmations found in the “pick me up” jar. I tried to put several little touches, like my favorite “throw away hate” poster. When students walk in, they can see the agenda for the day, learning targets, and homework. I used magnets to affix to the back of the bulletin borders and name tags to make this! My bookshelf– I had to sneak a little bit of my zombie collection on the top. Students can use the supplies here for our class or any other. I got the tissue paper banner when I was in Oaxaca, Mexico two summers ago. But seeing as I almost decapitated myself trying to hang them, I left them up there when I–much to my dismay–realized they were up backwards. I saw this on Pinterest, and I had to do it too. I found this decal at the Dollar Tree, and I had to put it up on my closet door. I love the Time Timer for time management in the classroom. Also it’s important to have hot water for a cup of tea during the really long days. Students are welcome to fill it up and make a cup for themselves as well. I also painted and folded that little heart in a paper art kit I got from Joann Fabrics. Teaching isn’t easy. When I’m having a really tough day, I open my closet door. In here, I have filled it with cards and letters and pictures I’ve received from students over the years. It’s my little secret for when I feel like I’m not enough. I went to a really awesome professional development on using picture rubrics. I had my students help me make one, and now I can just count from 1 to 5 to start class, and I won’t start until we’re at a 5! Get window markers! They are the best. Right now my windows are covered with students’ nicknames on them. Also, the Dollar Tree often has the solar powered dancing animals, and now a whole string of them dance along my window! Yay for student artwork and fake plants! I cut the little gold polka dots out of sticker glitter paper from JoAnn Fabrics. I thought it added a bit to the ugly vent! I tried to fill my room with great little posters from the Chicago Teacher Store! Another cool decal from the Dollar Tree. I try to hang up student work as much as possible. This came after Martin Luther King, Jr Day last year, where the students wrote an “I am King” poem and then decorated a crown to represent all the ways they are amazing. I made them wear their crowns when they read their poems aloud in the Poetry Cafe. My 8th period surprised me my cover my whiteboard with Happy Birthday messages last year. Balloons are actually not allowed in school due to a latex allergy, so I have no idea how the students got it past the front desk. Also, I put up the green posters all around the room about midway through the school through the school year. On them represent the multiple identities that students have, and we use them to explore who we are throughout the year! A beautiful placard I got for Christmas this year. Ideas of where I should put it up? In room 313, we find any reason we can to celebrate. So we always make a big deal about Birthdays! (Don’t worry, we don’t forget those that come in the summer). My student teacher and I hanging out in the two little desk spaces. We try to give the students as much space as they need! The uptick in the anti-acceptance and love rhetoric in the US has been disheartening. In my absence from school one day, I asked some seniors to decorate my door to let everyone know that all students are welcome in our classroom. The end product filled me with so much hope. Cheers to these amazing seniors! So that’s room 313. I hope you felt welcome!